7.1 How could I know if I'm in a container or not ? 7.5 I can't start my container, how could I debug ? Several additional isolation mechanisms (such as the “-o newinstance” flag to the devpts filesystem). The LXC package combines these Linux kernel mechanisms to provide a userspace container object, a lightweight virtual system with full resource isolation and resource control for an application or a system. Linux Containers take a completely different approach than system virtualization technologies such as KVM and Xen, which started by booting separate virtual systems on emulated hardware and then attempted to lower their overhead via paravirtualization and related mechanisms. Instead of retrofitting efficiency onto full isolation, LXC started out with an efficient mechanism (existing Linux process management) and added isolation, resulting in a system virtualization mechanism as scalable and portable as chroot, capable of simultaneously supporting thousands of emulated systems on a single server while also providing lightweight virtualization options to routers and smart phones. The first objective of this project is to make the life easier for the kernel developers involved in the containers project and especially to continue working on the Checkpoint/Restart new features. The lxc is small enough to easily manage a container with simple command lines and complete enough to be used for other purposes. At the time where I write this sentence, there is an issue with LVM container creation (here is a first Debian bug and a second one) on Debian Wheezy and it doesn't seams to be resolve soon. If it's not enough, you'll need to install the package with specific kernel version number corresponding to latest (ex. linux-image-3.11-2-amd64) and reboot on this new kernel. 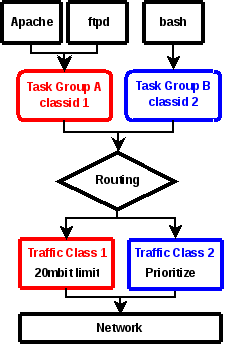 LXC is based on cgroups. Those are used to limit CPU, RAM etc...You can check here for more informations. cgroup RAM feature : "cgroup_enable=memory"
cgroup SWAP feature : "swapaccount=1"
All should be enabled to ensure it will work as expected ! If you don't configure your network configuration after container initialization, you'll have the exact same configuration on your guests (containers) than your host. That mean all network interfaces are available on the guests and they will have full access to the host. Another con, is to have the access to process on host. I mean that a SSH server running on host will have it's port available on the guest too. So you cannot have a SSH server running on guests without changing port (or you'll have a network binding conflict). How does it works for NAT configuration ? Now it's done, restart libvirt. # add checksum so that dhclient does not complain. You can create a private interface for your containers. Containers will be able to communicate together though this dedicated interface. Here are the steps to create one between 2 hosts. Now start the container and you'll have the 10.0.0.X dedicated network. br0 is replacing eth0 for bridging. It's recommended to use Grsecurity kernel (may be not compatible with the testing kernel)or Apparmor. It will deploy through debootstrap a new container. If your host has a btrfs /var, the LXC administration tools will detect this and automatically exploit it by cloning containers using btrfs snapshots. Then you could call it when you'll create a container with -f argument. You can create as many configuration as you want and place them were you want. I did it in /etc/lxc as I felt it well. d : Run the container as a daemon. As the container has no more tty, if an error occurs nothing will be displayed, the log file can be used to check the error. If you've problems to connect to the container, do this. This will remove all your data as well. Do a backup before doing destroy ! You can see all container changing states. This restart the cron service in "mycontianer" container. # therefore creating missing device nodes for tty1-4. chroot $rootfs "LANG=C /usr/sbin/update-rc.d checkroot.sh stop 09 S ."
chroot $rootfs "LANG=C /usr/sbin/update-rc.d umountfs start 09 0 6 ." chroot $rootfs "LANG=C /usr/sbin/update-rc.d umountroot start 10 0 6 ." chroot $rootfs "LANG=C /usr/sbin/update-rc.d hwclock.sh start 10 3 ." chroot $rootfs "LANG=C /usr/sbin/update-rc.d hwclockfirst start 08 3 ." chroot $rootfs "LANG=C /usr/sbin/update-rc.d module-init-tools start 10 3 ." echo "Failed to add configuration"
echo "'path' parameter is required"
echo "This script should be run as 'root'"
echo "failed to configure debian for a container"
echo "failed write configuration file"
Adapt the remote host to your distant SSH host or rsync without SSH if it's possible. During the transfer, you need to exclude some folders to avoid errors (/proc, /sys, /dev). They will be recreated during the lxc-convert. # fstab for the containers with advanced features like bindind mount. Cgroups can be changed on the fly. You should warn when you reduce some of them, especially the memory (be sure that you do not reduce more than used). You can see there are 7 cores (called processor). In fact there are 4 cores with 2 thread each on this CPU. That's why there are 4 cores id and 8 detected cores. If you need more documentation, look at the kernel page. If you've got error when trying to limit memory, check the FAQ. The actual problem is you can't check how many memory you've set and is available for your container. For the moment /proc/meminfo is not correctly updated. If you need to validate the available memory on a container, you have to write fake data into the allocated memory area to trigger the memory checks of the kernel/visualization tool. Memory overcommit is a Linux kernel feature that lets applications allocate more memory than is actually available. The idea behind this feature is that some applications allocate large amounts of memory just in case, but never actually use it. Thus, memory overcommit allows you to run more applications than actually fit in your memory, provided the applications don’t actually use the memory they have allocated. If they do, then the kernel (via OOM killer) terminates the application. That mean that "lxc.cgroup.memory.memsw.limit_in_bytes" should be at least equal to "lxc.cgroup.memory.limit_in_bytes". If you've got error when trying to limit swap, check the FAQ. You should take care if you want to create a mount entry in a subdirectory of /mnt. It won't work so easily. The reason this happens is that by default 'mnt' is the directory used as pivotdir, where the old_root is placed during pivot_root(). After that, everything under pivotdir is unmounted. A workaround is to specify an alternate 'lxc.pivotdir' in the container configuration file. Higher the value is, more the priority will be important. You can get more informations here. Maximum value is 1000 and lowest is 10. Another solution is to limit bandwidth usage, but the Wheezy kernel doesn't have the "CONFIG_BLK_DEV_THROTTLING" activated. You need to take a testing/unstable kernel instead or recompile a new one with this option activated. To do this follow the kernel procedure. You can see in the cpuset, the container name where I am ("mycontainer" here). this is because of a Debian bug that the maintainer doesn't want to fix :-(. Here is a workaround. > lxc-cgroup -n mycontainer memory.limit_in_bytes "128M"
Now reboot to make changes available. You can see that memory is available here. Now you can look at debug.out and see what's wrong. I got dpkg error issue while I wanted to upgrade an LXC containers running on Debian because grub couldn't find /. To resolve that issue, I needed to remove definitively grub and grub-pc. Then the system accepted to remove the kernel. You're now ok, on next reboot the IP will be properly configured automatically by LXC and it will work anytime. This page was last modified on 22 February 2015, at 00:26.